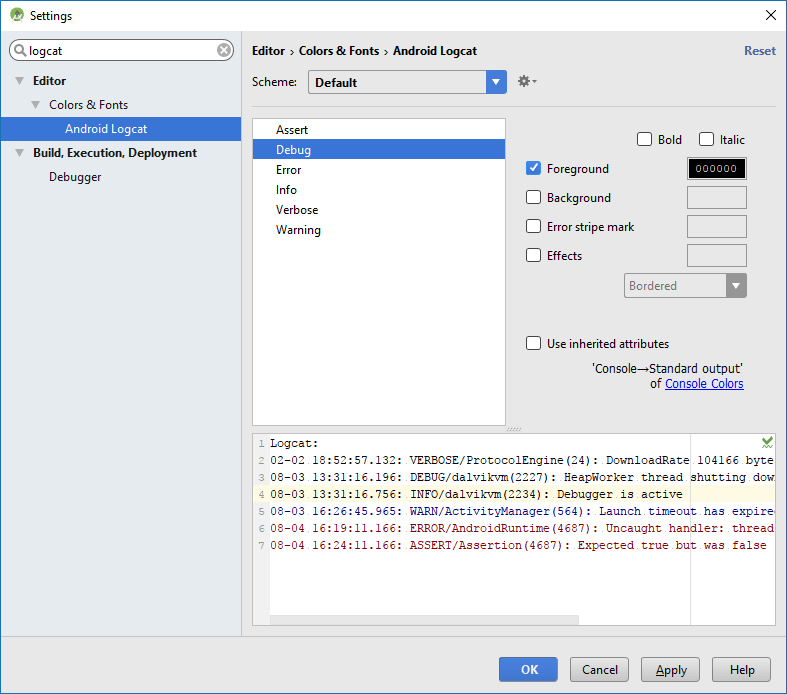 To properly log messages from your application you should use the android.util.Log class. This class defines the familiar informational, warning, and error methods that you can filter in the Logcat pane to see just what you want to see. Every log message has a tag associated with it, which is used to identify the source of a log message. It usually identifies the class or activity where the log call occurs. It's best to use the appropriate log level for the message you want to log. It is recommend to define a unique debug tag string for each class so that you can easily track down where a log message originated. You can use this tag to filter the logging data and find only the messages you are interested in. By clicking the main menu bar View > Tool Windows > Logcat. 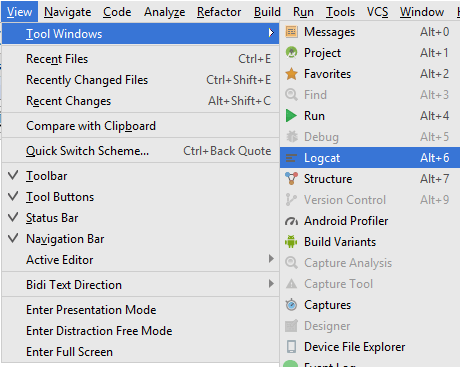 By clicking the Logcat Tool Button from the bottom of Android Studio. 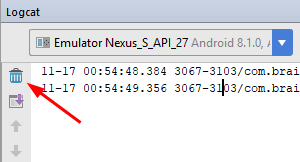 The following Logcat pane will appear on bottom of Android Studio. When this menu is set to Show only selected application, only those messages relating to the app selected in the menu marked as 2 will be displayed in the Logcat panel. Choosing No Filter will display all the messages generated by the device or emulator. 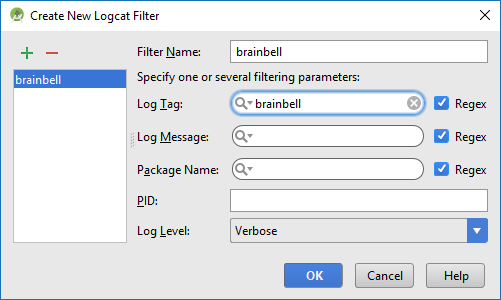 To get the most out of your application, Logcat has several levels of log messages, so Android Studio provides multiple ways of filtering the logcat output. One method is to use the Log Level dropdown menu, to filter based on log level, open this dropdown and select anything other than the default Verbose option. Filter name: give a unique name. Log Tag: Every log message has a tag associated with it, which indicates the system component the message originated from. If you want to see messages that originate from a certain system component only, you can enter that component's tag here. It is used to identify the source of a log message. It usually identifies the class or activity where the log call occurs. Log Message: If you only want to see messages that contain certain elements or character strings, specify them in the Log Message field. Package Name: If you want your filter to display messages that relate to a certain package only, enter this package name here. PID: If you only want to see messages that refer to a specific process, enter that process ID here. To change these options, you must save a copy of the current Theme by clicking the Save as button and enter some suitable name. Now select each log level one by one and apply your own font and background color, make log message bolt or italic and etc. Note: before starting the customization, uncheck the Use inherited attributes box, otherwise you won't be able to edit these options. Check Effects then select the effect from the drop down menu (e.g. underline, strikeout, or dotted line etc) and click its color box to customize the mark color. To apply changes, click on Apply and then OK. The "trash can" icon atop the tool strip on the left is the "clear log" tool. Clicking it will appear to clear Logcat. It definitely clears your LogCat view, so you will only see messages logged after you cleared it, though, that this does not actually clear the logs from the device or emulator. Note: Log has impact on performance. Excessive logging impacts device and application performance. At a minimum, debug and verbose logging should be used only for development purposes and removed prior to application publication.